I don't watch Gotham anymore. One season was enough for me. What little TV coverage we do here we found some time to recap it, and that had nothing to do with me. So I'm not going to judge how Cameron Monaghan has been during the years of teasing his character's eventual transformation into the Joker. I'm just going to say that I don't like the way this version looks. 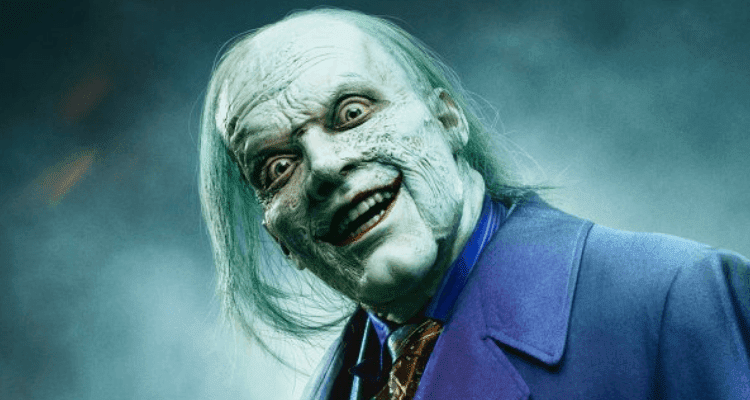 It's April Fool's Day but this first look at the Joker in Gotham is not a prank. Sporting the textbook purple suit, thinning hair that may have been plucked straight from Jack Nicholson's head, and a face that resembles old drywall, this has me wishing for the return of Jared Leto's gangsta Clown Prince of Crime. I don't think Joaquin Phoenix needs to look over his shoulder or anything. Criticism aside, as Gotham heads into the final season we're not only getting Joker, but li'l David Mazouz is finally tall enough to start playing Batman. Awwww. Watch the Gotham teaser below. And let me know if I should play catch up.